Bolivar Edwards Kemp ( born December 28, 1871 Amite, St. Helena Parish, Louisiana, † June 19, 1933 ) was an American politician. Between 1925 and 1933 he represented the state of Louisiana in the U.S. House of Representatives. Bolivar Kemp attended both private and public schools in his native country. He then studied at Louisiana State University in Baton Rouge. After a subsequent law degree from Tulane University in New Orleans and its made ​​in 1897 admitted to the bar he began in Amite to work in his new profession. He was also engaged in farming and in the freight forwarding business as well as in the banking industry. Since 1910 he has been a board member of the Louisiana State University. Politically, Kemp was a member of the Democratic Party. 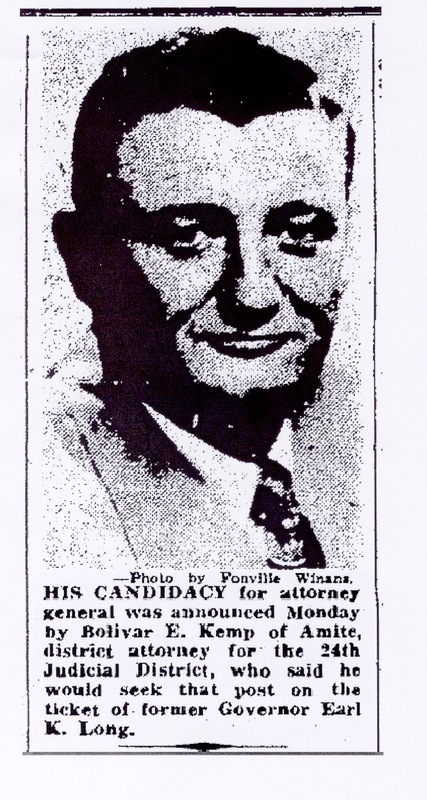 In the congressional elections of 1924 he was in the sixth electoral district of Louisiana in the U.S. House of Representatives in Washington DC chosen, where he became the successor of George K. Favrot on March 4, 1925. After four elections he could remain until his death on June 19, 1933 in Congress. Since March 4, 1933, he was chairman of the committee that dealt with the administration of the American territories. His successor came in the following months in Louisiana to political turmoil. Governor Oscar K. Allen tried to enforce the choice of Kemp's widow Lallie. This, however, came within the Democratic Party determined resistance. There you supported Jared Y. Sanders. After both candidates were proposed to the Congress as the successor to Kemp after each disputed elections, ordered this re -elections in which then Lallie Kemp renounced his candidacy. The election was contested by Sanders, who could take his seat in the House of Representatives on May 1, 1934.